A sarong is a piece of material wrapped around the waist and worn as a long skirt. It originated in Malaysia where sarongs are worn by men and women. In the Western Hemisphere they are typically beachwear worn mainly by women. There are many types of fabrics used for sarongs, some are traditional and others were developed for western markets. All of the materials are lightweight and easy to dye. Batik fabric has traditionally been used to make sarongs. It is woven linen treated with wax and the technique is used all across Southeast Asia and the Arabian Peninsula. The fabric itself is dyed first and treated with wax to hold in the dye making the cloth almost waterproof. Traditionally this sarong cloth was a single base color with patterns being reserved for nobility.Today, these sarongs come in a range of colors and designs, but tend to be more expensive than those made of other materials. Silk is an effective material to make sarongs with as it is lightweight and is easy to color. Thanks to modern manufacturing methods, silk is also not as expensive as it used to be. The main drawback is silk can snag, ladder and tear, but this can be overcome with the addition of modern fibers to strengthen the cloth. The cheapest sarongs on the market are made from woven cotton. Cotton is used in modern fashion because it is cheap, easy to clean, hard wearing and can be easily dyed. For these reasons it is the perfect sarong material. Its only disadvantage is it does not have the slightly sheer texture associated with sarongs. 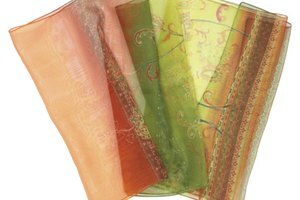 Chiffon is a transparent fabric made from cotton or silk, but can also be made from man-made fibers. It resembles a fine mesh net and is most commonly found on evening gowns and formal wear. Depending on its fiber components it can be easy to dye, but like silk can damage easily. 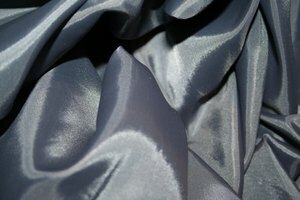 Similar to satin, charmeuse is a silk or polyester fabric which has two types of finishes. One side of the cloth has a bright luster like satin, the other side has a dull or matt finish. The synthetic versions are very cheap to produce and the silk variety is easier to color and pattern. It lacks the transparency of other sarong materials and is easily torn. It is not ideal for beachwear as water weakens the weave, but as sarongs become increasingly stylish it has been used for a more formal effect. Rayon and polyester are both widely used in the manufacture of inexpensive sarongs. These materials are easy to produce, are hard wearing and allow for coloring and patterning. 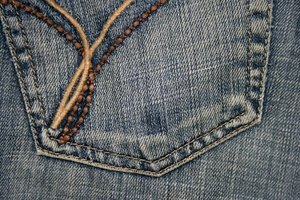 These fibers can either be used alone or woven into other natural cloths to add strength. 1 World Sarongs: What is a 'Sarong' ? 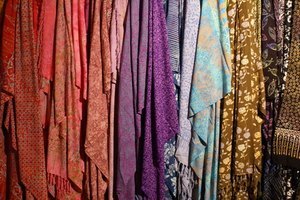 Sarong World: What is a Sarong?